When the going gets tough… | Damian Trasler's Secret Blog - Do Not Read! The real Terry Pratchett - I took this picture! January’s going out with a whimper, as they often do. This is the point where the resolutions begin to flag, where being a REAL writer is hard. But there are rules about writing, folks, rules we must obey. Trouble is, they’re not easy rules, like “Do not walk on the lava!” or “Remove your hat before showering.” No, these are hard rules, and the hardest one of the lot is Rule Number One: Keep writing. A few years ago Terry Pratchett came to the Winchester Children’s Book Festival and I stood in line to get him to sign a couple of books. As he signed, I nervously asked what advice he would give fledgling writers. But getting those four hundred words down every day is harder than we expect it to be, especially once the glow of the New Year’s Eve champagne has faded. Like going to the gym, or cycling to work, they are a responsibility we shirk too easily. And now, as Mrs Dim points out to me, we feel guilty about them. This time of year is replete with dire warnings about abandoned resolutions, lapsed gym memberships and running shoes thrown to the back of the wardrobe before they have had a chance to get really smelly. Ever eager to please, here’s a suggestion. Look at the targets you set yourself back when the year was only minutes old. Just for a fortnight, reduce them. Cut them in half if you like. Divide them by a factor of ten, any size reduction you like, just DON”T STOP! And to prevent any attendant guilt, feel free to print out the card below to hand to any fierce “I do a million words before breakfast, I do, and I compose a haiku while I butter me toast..” types you might meet. The journey of a thousand miles begins with a single step, but nobody said they had to be big steps, and running all that way isn’t good for you, especially after a heavy meal. Take it easy. 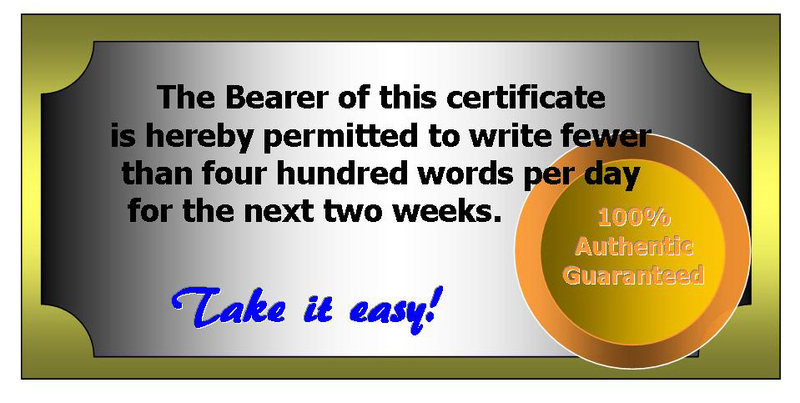 This entry was posted in Writing and tagged Damian Trasler, Mrs Dim, resolutions, Terry Pratchett, Writing tips. Bookmark the permalink. Good advice. So hard to follow! I remember how impressed I was when you first mentioned meeting Terry Pratchett. Still am. Hey Kate! Long time no squeak! 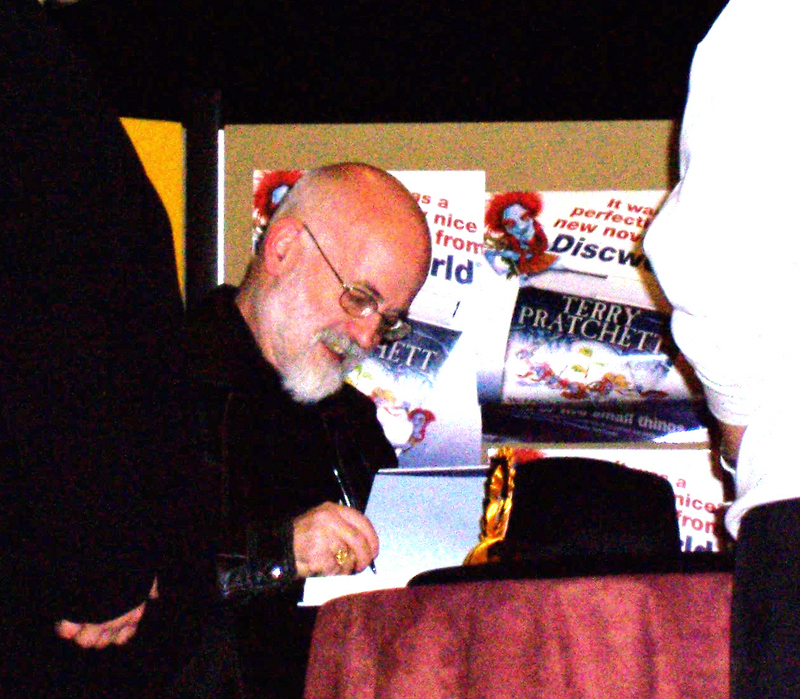 I’m glad I got to meet Mr Pratchett, even if it was only to stammer a question at him while he signed my books. A friend of mine had an ambition to meet Spike Milligan, but didn’t mange it before Spike died. Great shame. Good to (virtually) see you again!